If you have a garden on a hillside or sloped landscape, you know what a pretty setting this can be. However, the uneven setting can prove to be challenging when it comes time to water the garden. For proper lawn and garden irrigation, you want to maximize the delivery of the water with a minimal amount of runoff or waste. This is why drip irrigation is a great method of delivering water to a hillside garden. Drip irrigation releases water slowly into the soil, near the roots. The benefits are obvious. Since the water is released slowly, the chances of erosion or runoff are greatly reduced. Drip irrigation allows deep penetration of water in the soil, allowing the water to reach plant roots. Combining drip irrigation with a timer is a great way to water a hillside garden. You also need to consider things like the angle of the slope on the hill. This can help you determine how much water the garden will need on a weekly basis. There are drip irrigation systems that have different sizes and lengths of distribution tubing. 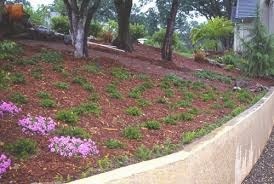 This gives you more options if there are hard-to-reach areas of your hillside garden. The timer can be used to ensure optimal drip irrigation watering.